This what happens when both The Gardener and the Harvest Manager leave town at the same time. 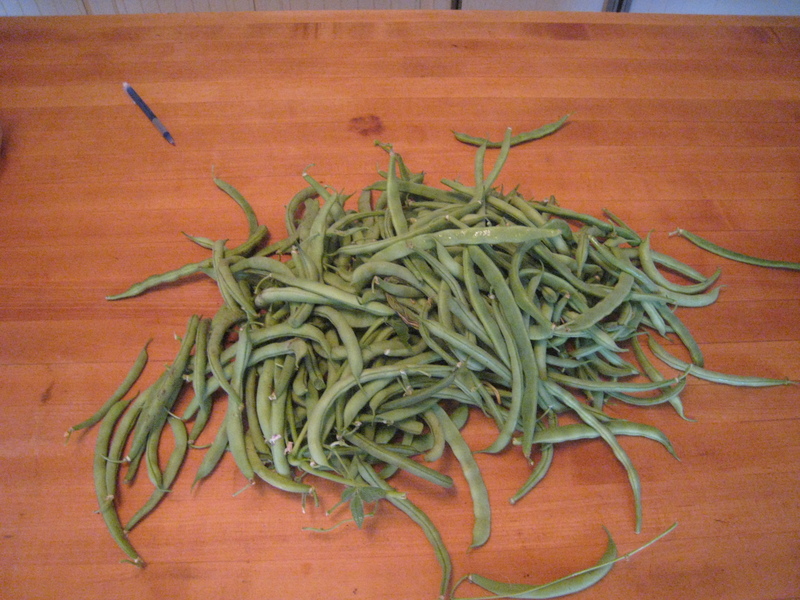 Green beans mature quickly, and for the tastiest, tenderist bean, one must pick daily. This pile represents about 3 1/2 pounds of beans. (The pen on the counter gives you an idea of the size of the pile.) Once I sorted the edible from the compostable, we had about 1 3/4 pounds. Half of the harvest ended up in the compost pile. That’s good for the compost, but not the best yield for the kitchen. How to manage the harvest? Bring a pot of water to boil and toss in the trimmed beans (I pinch off the ends) for four minutes. Drain, cool, and drop in a freezer bag. Beans preserved this way will last for a few months in the freezer. Cook as you would fresh or frozen green beans.